Josef Albers was one of Europe’s most influential artist-educators to immigrate to the United States during the 1930s. Following early academic training, Albers turned in 1920 to the innovative atmosphere of the Weimar Bauhaus where he began his experimental work as an abstract artist. After three years as a student, he was hired to teach the Vorkurs, the introductory class that immersed students in the principles of design and the attributes of work materials. Albers directed his students to develop an understanding of "the static and dynamic properties of materials. . . through direct experience." In his own work, Albers investigated color theory and composition and he began to explore mathematical proportions as a way to achieve balance and unity in his art. Yet, Albers did not approach his work from a purely intellectual perspective; he believed that “Art is spirit, and only the quality of spirit gives the arts an important place in life." Initially an expressionist, Albers began experimenting with abstract principles and unusual materials about 1923. His sophisticated glass assemblages of these formative years explored the qualities of balance, translucence, and opacity. left for America where he introduced Bauhaus concepts of art and design to the newly formed experimental community of Black Mountain College in North Carolina. After fifteen years at Black Mountain, in 1950, he became chairman of the Department of Design at Yale. 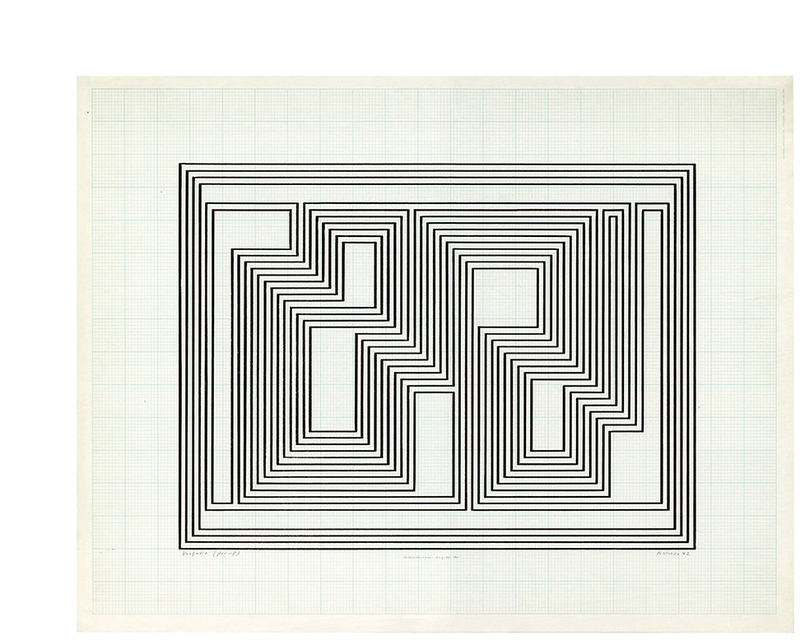 In 1949, Albers began his now famous Homage to the Square series. Always a careful craftsman, he often noted the pigments, brands, varnishes, and grounds he used as well as documenting his spatial proportions and the mathematic schemes he incorporated in each work. Although concerned with a highly formal regiment in his own work, Albers supported other approaches: "Any form [of art] is acceptable if it is true," he stated. "And if it is true, it's ethical and aesthetic." As a theoretician and teacher, he was an important influence on generations of young artists. In addition to painting, printmaking, and executing murals and architectural commissions, Albers published poetry, articles, and books on art. A major Albers exhibition, organized by the Museum of Modern Art, New York, traveled in South America, Mexico, and the United States from 1965 to 1967. A retrospective of his work was held at the Metropolitan Museum of Art, New York, in 1971. Albers’ work is held in numerous important private and museum collections throughout the United States and Europe. 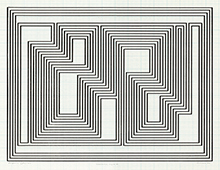 Edition 34, one of only 2 proofs on graph paper. Signed, dated and titled in pencil. Annotated (proof) and inscribed To Breitenbach in pencil. Image size 11 3/4 x 15 7/8 inches (298 x 403 mm); sheet size 17 x 22 inches (432 x 559 mm). A fine, black impression on Dietzgen blueline graph paper, the full sheet with wide margins (2 1/2 to 3 1/8 inches), the image alligned precisely to the sheet grid. A professionally repaired tear (1 1/4 inch) in the center right sheet edge, barely visible, otherwise in excellent condition. Albers’ ambitious printmaking project Graphic Tectonics was inspired by his enchantment with the ancient (ca. 500 BC) monumental architecture of Monte Albán in Oaxaca, southern Mexico. In this series the artist has reduced the hundreds of man-made terraces surrounding the ceremonial center of the site to a system of linear geometry (in this impression accentuated by the graph paper). The two-dimensional rendering both reveals the precise balance unifying the structures, and succeeds in suggesting their volume. The parallel black lines create a visual vibration; the negative spaces they surround consequently implying openings or doors, perhaps to other dimensions. Having fled to Paris when Hitler came to power in 1933, German photographer Joseph Breitenbach made portraits of many artistic luminaries including Bertolt Brecht, Max Ernst, James Joyce, Aristide Maillol and Wassily Kandinsky. Introduced to Surrealist ideology by Ernst, his work was included in important Surrealist photography exhibitions with contemporaries Man Ray, Brassaï, Henri Cartier-Bresson, Eli Lotar and Roger Parry. Interned by the German occupiers, Breitenbach escaped in 1941 via Marseille, and arrived in New York City in 1942. He came to the attention of Walker Evans, who published his work in Fortune. in the summer of 1944 he was invited by Joseph Albers to teach photography at Black Mountain College. In 1946 he became a United States citizen and joined the faculty at Cooper Union and later at The New School. Breitenbach continued to create distinctive and innovative photography throughout his later years. Collections: Museum of Modern Art (plain paper), Metropolitan Museum of Art (plain paper).